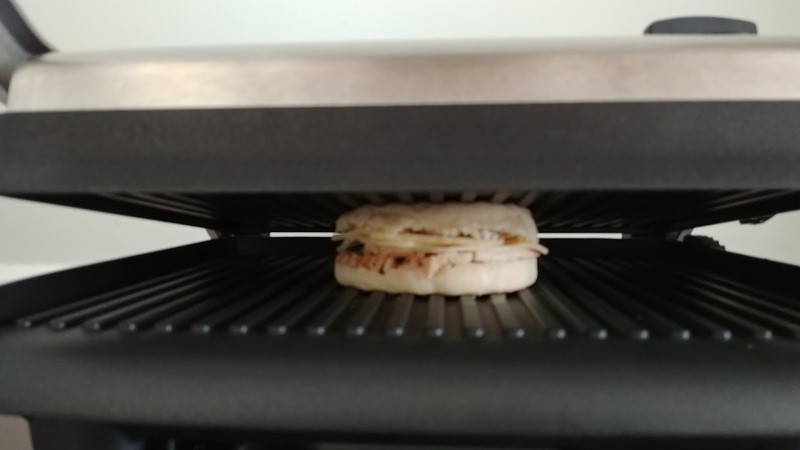 This past holiday season, we were gifted with a panini grill. I always thought a panini press was kind of stupid when there are other ways to make a panini at home. Why buy another kitchen gadget? Then we started eating more grilled sandwiches for dinner but someone would always forget to get the butter out in time to soften. That meant we'd tear the bread as we tried to spread the butter. So then we tried using our ancient George Foreman grill, but it doesn't close evenly so you have to keep maneuvering your sandwich around to make sure all the bread gets toasted. Plus, the sandwich likes to slide down the sloped grill. We also tried using a griddle and a grill pan, using a heavy pan on top to press the sandwich, but results were just OK. So we started looking at panini grills. 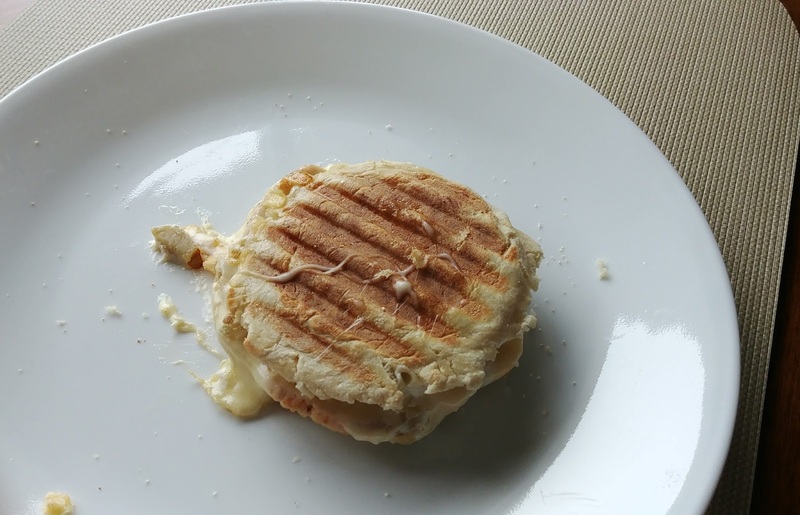 Ever since we received the panini grill, I've been making panini for lunch. 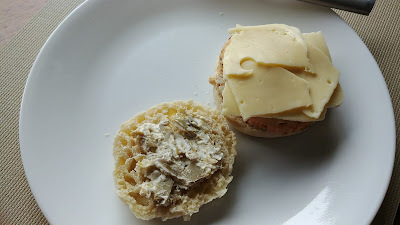 I still eat English muffins, roast turkey, and a cheese for lunch, but I've been trying to add flavor and variety with different spreads. For the first week or so, I used up the Gouda Cheese Logs. Next up I made a mushroom mixture like the filling for Mushroom Turnovers and added arugula, no turkey. It was tasty, but the mushrooms constantly oozed out and it was not especially filling. The next week I roasted some grape tomatoes and added those to my turkey & cheese sandwich. They added a lot of flavor but since I still tend to stuff my panini too much, the roast tomatoes oozed out and made a mess on the grill. This week, I'm trying an Artichoke Spread. It's tasty. 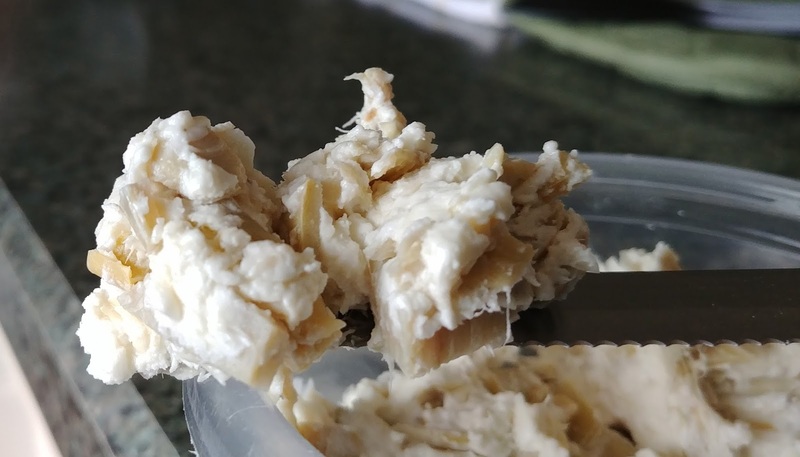 Creamy from cream cheese and tangy from the marinated artichokes with a sharp, nutty flavor from the parmesan. It definitely makes my lunch sandwich a little more appealing. I try to not spread it too close to the edges so it doesn't ooze out when it's pressed. Early on in the pressing. It's not oozing yet. The finished panini. Yup. The Swiss and the Artichoke Spread oozed out. But it's so yummy, melty and gooey. 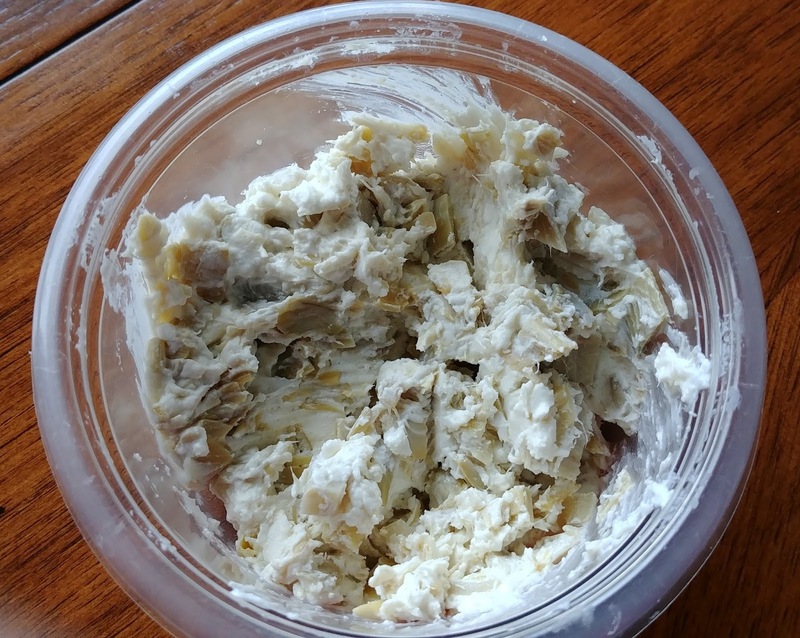 It reminds me of the Hot Artichoke Dip we make to eat with tortilla chips. I have lots of ideas for the coming weeks - we'll see how long this panini sandwich spread fad lasts! Mix all ingredients together. Season with salt & pepper. If desired, you could add a little lemon zest or a dash or two of hot sauce.